On April 19, an asteroid named 2014 JO25 will safely fly by Earth, passing at a distance of about 1.1 million miles (1.8 million kilometers) of the planet. This asteroid poses no threat to Earth and, in fact, asteroids safely fly by Earth quite regularly. What makes the upcoming close approach of asteroid 2014 JO25 unique is that it is a rather large asteroid, measuring about 2,000 feet (more than 600 meters) across. The last time an asteroid that large, or larger, came that close to Earth was in 2004. Not much is known about asteroid 2014 JO25 other than its approximate size, its trajectory (or path around the sun) and that its surface is about twice as reflective as that of the moon. When it passes by, the asteroid will be bright enough that small optical telescopes can be used to spot it in the night sky. Scientists around the world will also study the asteroid with telescopes to determine its composition and rotation and with radar that could reveal small surface features. Explore our collection of standards-aligned lessons all about asteroids! › View Asteroid Lessons from NASA! Asteroids are some of what remains of the material that formed our solar system about 4.6 billion years ago. Unchanged by the forces that have altered rocks on our home planet, the moon, Mars and other destinations around the solar system, asteroids provide a glimpse into what conditions were like when our solar system took shape. Studying the chemical and physical properties, as well as the location and motion of asteroids, is vital to helping us understand how the sun, planets and other solar system bodies came to be. The study of asteroids is so important, in fact, that NASA has sent several spacecraft to study some of these objects up close. For example, in 2007, the Dawn mission was sent to explore the two largest objects in the asteroid belt, Vesta and Ceres. Dawn arrived at the giant protoplanet Vesta in 2011 and orbited it for about one year before flying to the dwarf planet Ceres, which it continues to orbit and study today. Data from the Dawn mission showed Vesta to be a fascinating world more closely related to terrestrial planets than to typical asteroids and revealed clues that indicate there is a large amount of ice and maybe subsurface liquid water on Ceres. In 2016, NASA launched a spacecraft called OSIRIS-REx, which is headed for an asteroid called Bennu. When it arrives in August 2018, OSIRIS-REx will map the asteroid and collect a sample to return to Earth. Learn more about NASA's OSIRIS-REx spacecraft and its mission to asteroid Bennu. 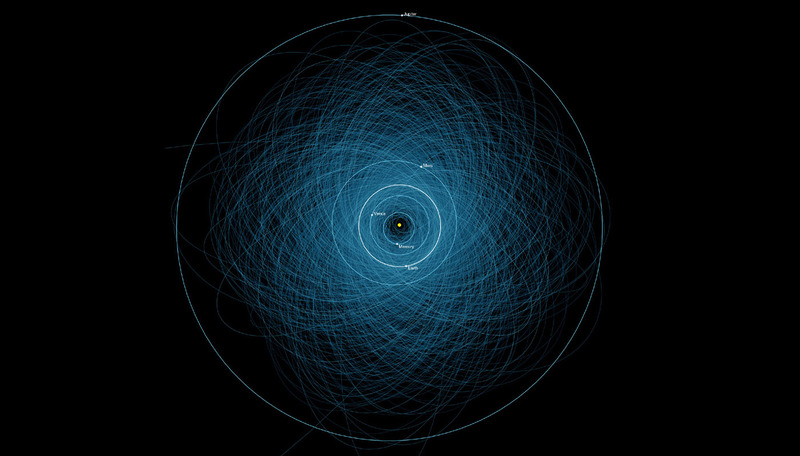 But there is another reason studying asteroids and their movements is important: detecting nearby asteroids and predicting any hazard they might pose to Earth. Both 2014 JO25 and Bennu are considered near-Earth objects, meaning their orbits bring them closer than 1.3 astronomical units (AU) from the sun. For comparison, Earth is 1 AU from the sun, or about 93,000,000 miles (150,000,000 kilometers). Also, both asteroids are classified as “potentially hazardous.” A potentially hazardous asteroid is one with an orbit that comes within 0.05 AU (about 4,650,000 miles or 7,480,000 km) of Earth’s orbit and has an absolute magnitude, a measure of brightness, of 22 or less. (On the magnitude scale, the lower the number, the brighter the object.) Absolute magnitude can be an indicator of size, so in other words, potentially hazardous asteroids are large – typically larger than about 500 feet (140 meters) across – and could get close to Earth. Having a designation of “potentially hazardous” does not necessarily indicate the object is a threat to Earth. Scientists use the classification to indicate an object deserves increased attention. Out of more than 730,000 known asteroids, about 16,000 are near-Earth objects, and there are currently 1,784 potentially hazardous asteroids. But the risks of a large asteroid like 2014 JO25 or Bennu impacting Earth are exceedingly rare. And thanks to the Center for Near Earth Object Studies, or CNEOS, at NASA’s Jet Propulsion Laboratory, we have a very good understanding of where many of these asteroids are and where they are headed. Supporting NASA’s Planetary Defense Coordination Office, CNEOS continually uses new data acquired by telescopes and submitted to the Minor Planet Center to update orbit calculations, analyzes asteroid impact risks over the next century and provides data for every near-Earth object. Detecting near-Earth objects, or NEOs, is done by comparing multiple images, taken several minutes apart, of the same region of the sky. The vast majority of the objects appearing in these images are stars and galaxies, and their positions are fixed in the same relative position on all the images. Because a moving near-Earth object would be in a slightly different position on each image while the background stars and galaxies are in the same positions, it can be easy to identify the moving target if it is bright enough. Surveys done by NASA-supported ground-based telescopes – including Pans-STARRS1 in Maui, Hawaii, as well as the Catalina Sky Survey near Tucson, Arizona – have identified thousands of near-Earth objects. 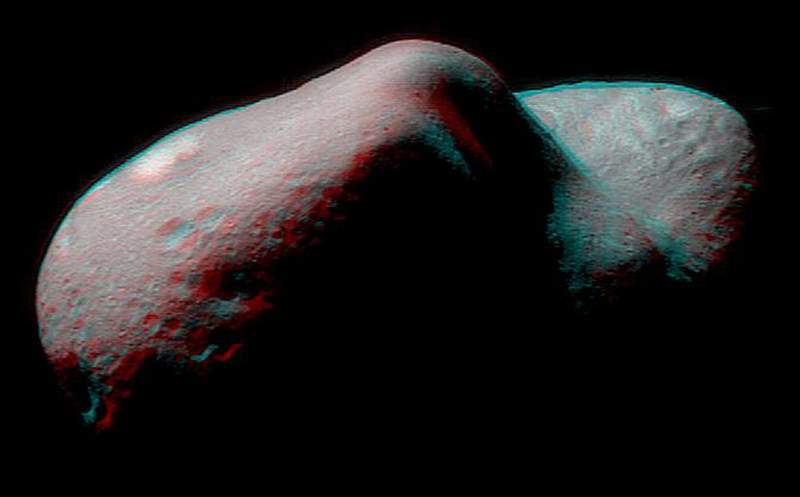 And a space-based telescope called NEOWISE has identified hundreds of others while scanning the skies at near-infrared wavelengths of light from its polar orbit around Earth. Many ground-based telescopes perform follow-up observations to further aid in orbit calculations and to study the physical properties of the objects. Once a near-Earth object is detected, its orbital characteristics are analyzed and astronomers determine if it is a potentially hazardous asteroid. This information is entered into CNEOS’ database, where it is continually updated and impact risks are monitored as new data becomes available. Grades 1-6: Whip Up a Moon-Like Crater - Use baking ingredients to whip up a moon-like crater as an asteroid-impact demonstration for students. This activity works in classrooms, camps and at home. Grades 3-5: Modeling an Asteroid - Students will shape their own asteroid models out of clay as a hands-on lesson in how asteroids form, what they are made of, and where they can be found in our solar system. Grades 8-12: Math Rocks: A Lesson in Asteroid Dynamics - Students use math to investigate a real-life asteroid impact. All ages: If you have a telescope, consider trying to view the asteroid at night. You’ll have to know where to look. Solar System Ambassador Eddie Irizarry shares how to find 2014 JO25 here. If you’re looking for more technical information about its location, use JPL’s Solar System Dynamics site to find the asteroid’s ephemeris. Follow @AsteroidWatch on Twitter or visit the NASA Asteroid Watch website to find out more about upcoming close approaches.